Genuine Tarentaise village below Les Coches. Linked to La Plagne's huge ski area since 1972. Summer glacier skiing available at the top of La Plagne. When will it snow in Montchavin-Les Coches? The next notable snow forecast for Montchavin-Les Coches is 1cm1in, expected on 23 April, with around 3cm1in forecast over the next 7 days. How High is Montchavin-Les Coches? The French Ski Resort of Montchavin-Les Coches is part of the La Plagne ski area with access to 225km140 miles of downhill skiing, with 128 marked pistes, served by a total of 109 ski lifts. In addition to the skiing in Montchavin-Les Coches itself (215km134 miles of pisted ski runs), the appropriate ski Lift Pass will allow you to ski or snowboard in the other La Plagne ski resorts of Aime La Plagne, Belle Plagne, Champagny en Vanoise, Plagne 1800, Plagne Bellecôte, Plagne Centre, Plagne Montalbert, Plagne Soleil and Plagne Villages. With ski lifts as high as 3,250m10,663ft, skiing and snowboarding is assured throughout the season. Montchavin and les Coches are neighbouring hamlets, often marketed as a single place - Montchavin - Les Coches. They are certainly easy to ski between, but Les Coches is 200 vertical metres further up the mountain so it's a bit of a walk if you're not on the ski lift or the free ski bus. Montchavin is one of the few traditional villages in the area and both centres are designed with traditional alpine wooden chalet style buildings, so are certainly amongst the most attractive and most genuine of the French resorts. The villages are part of the huge La Plagne ski area which has ten or so bases (depending on where you divide it up), seven of them are relatively close together purpose-built altitude centres, the other Plagne Montalbert is, like Montchavin - Les Coches - somewhat separate to the rest. The villages became a key part of a great pass with the opening of the Vanoise Express cable car - the world's largest, a 200 person double decker - which links the giant La Plagne ski area with neighbouring giant Les Arcs across the valley. The cable car access point is by Montchavin - Les Coches. The resulting ski area, Paradiski, is one of the world's biggest with more than 400km of piste. There is even a fourth dimension to extend the amazing ski potential these villages offer still further. The Savoy Olympic Ski pass is valid for a day in many famous ski areas in the region, together offering more than 1,500km (about 1,000 miles) of ski runs. The longest possible descent in Montchavin-Les Coches is 15km9 miles long. On the slopes La Plagne can offer something to suit all tastes. There are wide motorway pistes, short sharp blacks and terrain that varies from glacier to powder snowfields and forest. All in all the 225km (140 miles) is the largest amount of skiing offered by one resort anywhere and the 2000m top-to-bottom vertical is pretty vast also. If that's not enough for you tickets purchased for six days or more also valid for a day each in other top Savoie Alps destinations from the '92 Olympics such as the Espace Killy and Trois Vallées. 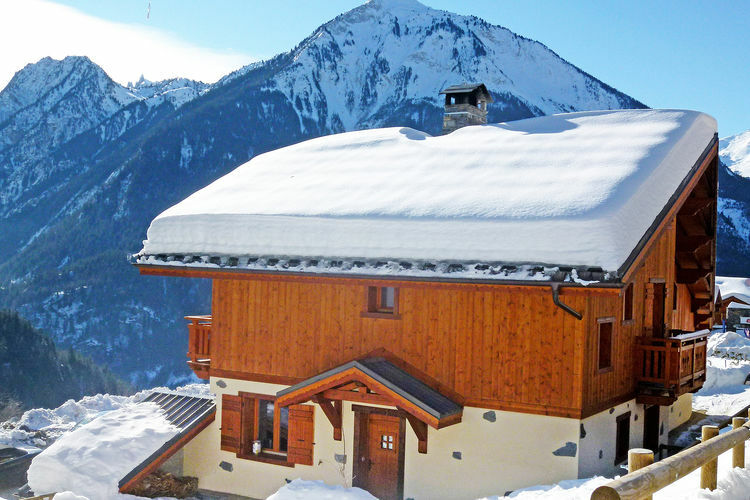 More convenient though is the Paradiski link be the spectacular Vanoise Express double-decker cable car to the Les Arcs ski domain across the valley, more or less doubling the skiing available from your doorstep. Indeed Paradiski is one of the world's biggest ski areas. All of the skiing above the altitude villages is also above the tree-line and most of it below their level is below it - on trails cut through the forests down to Plagne Montalbert and Montchavin Les Coches. The runs down to Champagny are over the back of the snowbowl. The vast majority of the skiing appeals to recreational skiers, more than the 'die-hard' variety who will find a more limited number of blacks than at some of the other top resorts. For those with a bit of realism who don't need the machismo image that they aren't actually a part of in order to enjoy their annual skiing week though, La Plagne can't be bettered. Experts will be happy anyway, especially if they sign up with one of the ski schools to tackle the under-rated off-piste or attempt the sheer near 2000m vertical down from the north face of the Bellecôte glacier, one of the world's longest and toughest runs . Beginners also have some good nursery slopes, a huge choice of tuition deals and a free surface lift by every village of La Plagne. La Plagne's commitment to winter sports has long been evident with its own Club des Sports established in 1962 to encourage domestic talent. Famous Club members include Eric Labourex, five times Freestyle World Cup circuit winner) and most recently Jean Luc Crétier, winner of the Men's downhill at the Nagano Olympics. There are no less than 11 different Ecole de Ski Français operations in business from the different villages. Each offers a wide variety of tuition options but also individual schools have unique ideas. The ESF in Montchavin for example has a guided off-piste 'Ski total' course whilst Plagne Bellecôte's school has carving-ski courses. At Aime la Plagne the 'Modern stages' package introduces students to the different modern methods of sliding as well as offering advice on improving technique and powder skiing. Apart from the ESF there are yet more choices the Oxygène school operating out of Plagne Centre or Eric Laboureix's 'El Pro' school. Evolution 2, based in Montchavin limits class sizes to 8 participants. Good skiers may wish to participate in the popular free night-time (floodlit) parallel slalom races at Champagny on Tuesday evenings during the Christmas and February holidays. There are cups for winners and prizes for competitors. Finally cross-country skiers have about 90km (57 miles) of loipes to enjoy. La Plagne has put a lot of thought and a lot of effort in to its snowboard offering. You'll find large areas of untouched snow to explore after a storm with specially marked out routes and zones where you can find hits galore. There are four snow parks in the area, including one at Montchavin-l.es Coches, at the top of the local area and next to the Vanoise Express arrivals point. The Park has a permanent boardercross, a beginners' zone and lots of rails, including rainbow rails as well as table tops and a variety of kickers for all ability levels. In common with the other La Plagne parks, the Montchavin - les Coches Park has a sound system and a supervisor. When is Montchavin-Les Coches open? Usual opening is mid December, and usual closing is Late April. NOTE:- Lift and Piste openings are always subject to Snow Conditions in Montchavin-Les Coches. Montchavin-Les Coches is able to make snow, on 50km31 miles of ski runs, with 295 snow cannons. The 20 ski lifts of Montchavin-Les Coches are able to uplift 120,600 skiers and snowboarders every hour. Montchavin-Les Coches is in the French Alps in La Plagne, Paradiski, France. The nearest airports to Montchavin-Les Coches are Chambery, Grenoble and Annecy. There are seven airports within three hours drive. Montchavin and Les Coches both have a selection of bars and night spots. In Montchavin the Camp de Base Cafe is popular through the evening with the discotheque l'Oxygene opening later on for those with the energy. In Les Coches the Last One Pub, La Poze music bar and Le Shooter's are all normally busy. A unique evening activity is the resort's Olympic bobsleigh run, a shuttle bus is provided once a week from Montchavin. Here you can try the bob-raft (a covered bobsleigh for four with no pilot), the taxi-bob (a competition bobsleigh for three people and a pilot) and the mono-bob (descend on your own, riding in a semi-horizontal position). There's also ice skating on an 800 sq m rink just above Les Coches some evenings; a cinema in Montchavin with two or three screenings daily and occasionally in the original version (ie not dubbed into French); as well as evening snowshoe hikes and dog sleigh rides. Want to Know when it Snows in Montchavin-Les Coches? 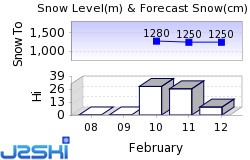 Click above to get Snow Reports by e-Mail for Montchavin-Les Coches. By doing so, you agree to Our Rules. Other Ski Areas within La Plagne. Other popular Ski Areas near Montchavin-Les Coches. Ski Hire Shops in Montchavin-Les Coches. Common questions about Montchavin-Les Coches. Want to ask about skiing and snowboarding in Montchavin-Les Coches? Or contact Montchavin-Les Coches Tourist Office. Note :- The information on J2Ski concerning Montchavin-Les Coches, where not clearly factual, is opinion only and is neither definitive or exhaustive. Warning :- Snow Sports are Dangerous! Skiing, snowboarding and all winter sports involve risk of serious injury or death. You MUST confirm all information, especially snow and weather conditions, in Montchavin-Les Coches before you ski or board. You participate at your own risk.